Gastroscopy Clinic - STARWOOD EQUINE VETERINARY SERVICES, INC.
Show season--with the hauling and workload--can be stressful for everyone. Unfortunately, this stress can cause ulceration of your horse's gastrointestinal tract. Many horses that have gastric ulcers are asymptomatic, but a study has shown that 2 out of 3 active horses have some degree of ulceration. Some of the symptoms of gastric ulcers are decreased appetite, reluctance to perform, weight loss, dull coat, or general colic symptoms. ​In preparation for the 2018 show season, we are offering a special clinic for your horses during this offseason -- a gastroscopy clinic. We will be waiving the farm call and set up fees as well as offering discounted treatment plans. Clinics must have at least 3 participants per location and be scheduled before January 31st, 2018. Contact the Starwood Equine office for more information or to schedule. 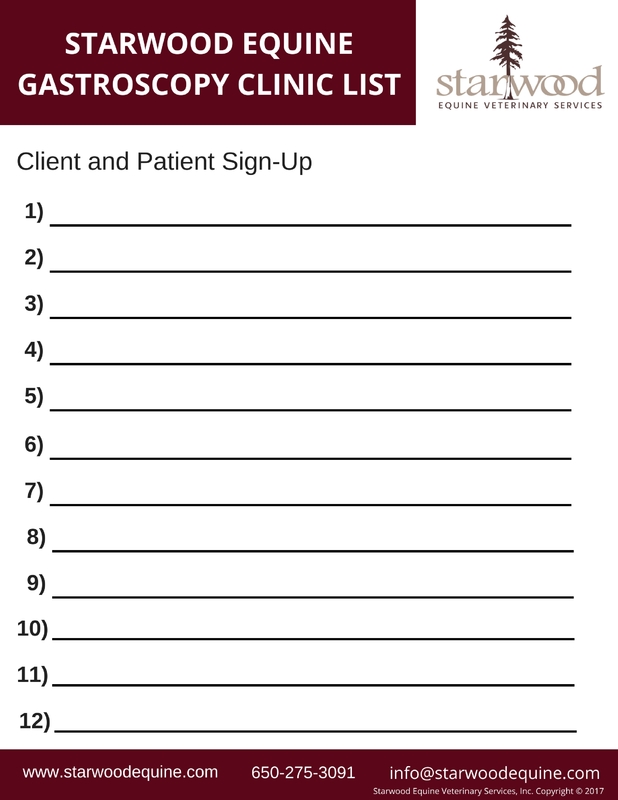 Would you like to be contacted about scheduling a gastroscopy clinic?